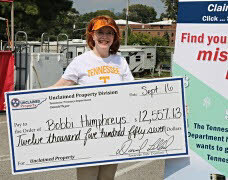 The Tennessee Department of Treasury Unclaimed Property Division is traveling to events across the state to reunite Tennesseans with missing money. Last fiscal year, the Division returned a record-breaking 43,482 claims, resulting in $48 million in missing money returned to Tennesseans. 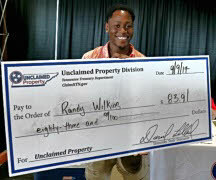 The Unclaimed Property Division is a consumer protection program of the Tennessee Department of Treasury, under the leadership of Treasurer David H. Lillard, Jr. There is currently more than $819 million waiting to be claimed in Tennessee. In an effort to raise awareness for the program and return missing money to even more Tennesseans this year, representatives from the Treasury’s Unclaimed Property Division will be visiting even more events across the state throughout 2018. 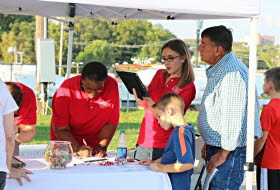 Tennesseans are encouraged to stop by the Unclaimed Property booth to find out if they have missing money. Division representatives will be on-site to help attendees begin the claims process and answer any questions attendees may have. Currently, the largest amount found by an individual at one of these events is $13,466.04. “These events have been an excellent way to help increase awareness for this program,” said Treasurer Lillard. “Our hope is that even more people will take just a few minutes to search to see if they have unclaimed property.” To search for Unclaimed Property in Tennessee, visit www.ClaimItTN.gov. More locations will be announced soon. Click here for an ongoing list of events.